When John Terry made his will, he named his daughter Joan and his son in-law as Edward Emptage. Edward Emptage was the son of Richard Emptage and Joan Alleyne. He was a yeoman and church warden at St Nicholas at Wade. He married Joan Terry in 1591 at St Martin’s, Herne. Joan Emptage died in 1608 and her memorial inscription in the church of St Nicholas at Wade notes that she had 6 sons and 2 daughters. However, when her father, John Terry, made his will in 1615, only four grandsons were named: Richard, Edward, Ralph and Thomas, which makes us think that two sons had died in infancy or childhood. Of the two granddaughters, only Mary was named. The second daughter, Martha, married William Joade, a yeoman of Wickambreux, in 1616 in St Mary’s, Sandwich. Perhaps John Terry thought that she would be taken care of by her future husband and therefore chose not to make a bequest to her, as often happened. 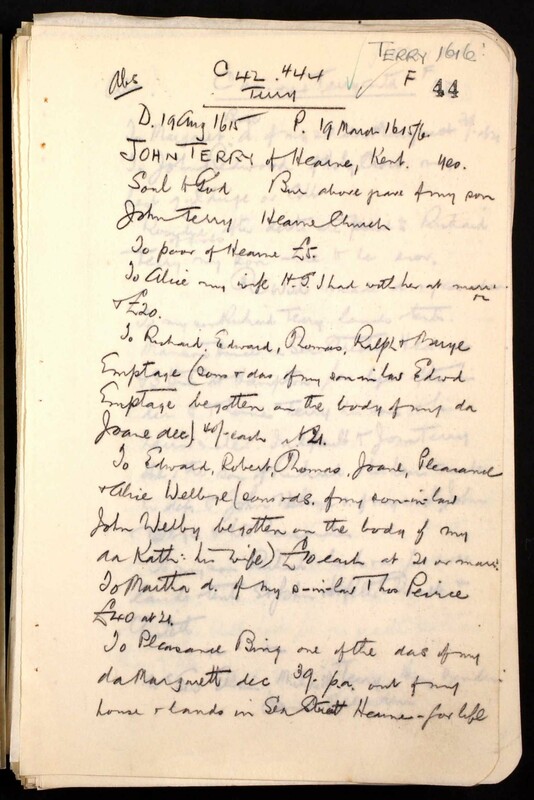 To each of the five named grandchildren, John Terry left 40/- ( 40 shillings) when they reached the age of 21. His bequests to the grandchildren by his other children varied from 20/- to £40 each. Was the disparity between the bequests to the Emptage grandchildren and the other grandchildren a sign of wealth in the Emptage family? 1. 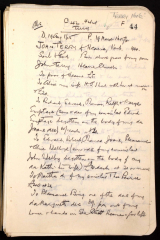 The will was recorded by Frank Watt Tyler in his genealogical collection of notebooks held by the Institute of Heraldic and Genealogical Studies and is available on Ancestry.co.uk. 2. 40 shillings was £2. According to the National Archives currency converter, a general guide for historical values, the value of £2 of 1610 or 1620 money would be some £263 – £270 in 2017. In 1610-1620, it was enough to buy 0 horses or 1 cow or pay 40 days wages for a skilled tradesman.